Neeti Parashar has an insatiable appetite for learning about nature's smallest building blocks -- and how they came to exist. A professor of physics at Purdue Calumet, Parashar is a member of the research team that earlier this year confirmed the existence of the Higgs boson subatomic particle. The groundbreaking discovery solidified theories about how all matter in the universe came to exist. 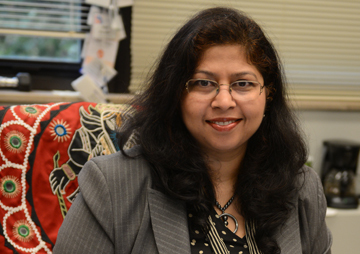 In addition to her research activities, Parashar was named an Outstanding Teacher and Outstanding Scholar during Purdue Calumet's Faculty-Staff Convocation in August. How were you involved in the Higgs boson discovery? Purdue Calumet High-Energy Physics primarily works at the U.S. Department of Energy's Fermilab, which is in Batavia, Ill.
My research group helped build the forward silicon pixel detector that was used in the Compact Muon Solenoid (CMS) detector at the Large Hadron Collider, or LHC. The LHC is the largest high-energy particle collider ever made, and it's located in Switzerland as part of the European Organization for Nuclear Research (CERN), which is a multinational research center. The LHC began collecting collision data in earnest in 2009, and the purpose was to try to answer some of the biggest outstanding questions in the field of physics, including why subatomic particles have mass. In July 2012, data collected by the pixel detector along with other components indicated the presence of a new subatomic particle. At that time, we didn't know for sure that it was the Higgs boson, because we hadn't yet analyzed its properties. But earlier this year, in March, we were able to pinpoint two properties -- namely, the particle's spin and parity -- that identified the particle as the Higgs boson from the Standard Model of particle physics. This discovery was huge because, although the particle had been theorized since 1964, no one had been able to confirm its existence. With our discovery, we did that and we also confirmed the existence of the Higgs field, with which subatomic particles interact to gain mass. Basically, the fact that you and I exist is because of the Higgs boson particle and this field. They explain how particles bind together and, in turn, how they form atoms, molecules, objects, and so on. The existence of everything we see is a manifestation of the Higgs boson field. This discovery was so important that the 2013 Nobel Prize in physics was given to Peters Higgs and Francois Englert, two of the six original theorists who postulated that the particle and the field exist. Who else from Purdue was involved in this discovery? All together, there were about 6,000 scientists involved in the discovery of the Higgs boson at the LHC, including 2,000 scientists from the U.S. Several scientists from Purdue's West Lafayette campus also were involved (for more information about West Lafayette faculty involvement in the discovery, see Purdue's news release). Also involved in the discovery were the members of my research group at Purdue Calumet. Over the years, in my group, nine Calumet students and four postdoctoral research associates have contributed to the research. When the Nobel Prize in physics was announced on Oct. 8, we held a press conference at Calumet to talk about our involvement in the discovery of the Higgs boson. Five Calumet students, one postdoctoral research associate and myself participated in the press conference. It was a very proud and historical day for our campus. How do you make physics, a field that is traditionally quite challenging, accessible to all students? Recently, I've taught a class called "The Origin of the Universe" that covers a wide range of very basic physics, from the Big Bang theory all the way up to the current state of particle accelerators and research. This class is aimed mostly at non-science students, so I keep the material very understandable and broken down to the students' level. The course has proven wildly popular. One of the reasons I think it's so appealing is because everyone wants to know how the universe was created, but they don't want to be intimidated by the subject matter. Unfortunately, physics has a reputation as a very difficult field, so I want to do everything I can to build interest in it. If that gets more students interested in taking a closer look at physics, so much the better. What is one of the main things you try to communicate to students interested in physics? The opportunities available to them in the area of high-energy physics at Purdue Calumet are incredible. Most students are not even aware of the internationally recognized Fermilab facility, which is just about 60 miles from Purdue Calumet. Our students have the opportunity to do research at Fermilab and at CERN, and that can give them an incredible head start, hands-on experience and exposure in their careers. I want our students to know that, if they're interested in physics, they have access to a world-class facility and that world-renowned researchers can actually be their mentors and collaborators. For me, when students say that they have benefited from my instruction and that they remember me as a good influence, I feel on top of the world. It's moments like these that make my job as a professor very rewarding.